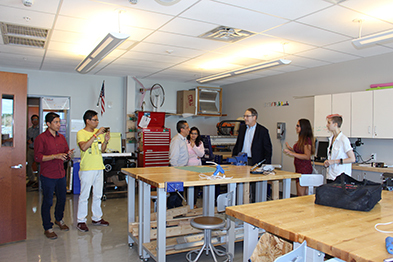 A Colombian delegation receives a tour by student ambassadors of the TVHS fabrication lab. Tech Valley High School welcomed a delegation from Colombia on Friday, Sept. 9 during the group’s national multi-stop tour of American education institutions. Exchange best practices with educators and curriculum developers. TVHS is a nationally-recognized New Tech Network Demonstration Site. We are committed to supporting schools in their implementation of student-centered teaching and learning environments. For more information about tours, program study, teacher residencies and other professional development opportunities, visit our Professional Development page.